E-retailing has opened up the world to big and small businesses, giving them access to customers around the globe. But stiff competition in this sector has led to e-retailers relying on factors like free shipping and flexible returns to attract customers which, in turn, presents a whole new set of challenges – particularly when it comes to managing returns. It’s estimated that one third of all online sales end up being returned to the retailer. With returned items costing $12 a piece notwithstanding the cost of shipping, repair of damaged products and repackaging, e-retailers are spending a huge amount of money simply to manage returned goods. While raising the cost of products and tightening return policies may be tempting, the best way to address this dilemma is to take steps to reduce return rates. The reason behind 22% of e-commerce returns is because the appearance of the actual product differs from the image customers viewed online. Retailers can minimize this by providing adequate information about the product to the customer at the time of purchase. Product descriptions should be extensive and include limitations, if any. Displaying 3D images, videos or multiple images of the product from various angles and with a zoom option can provide more true-to-life visuals. Retailers can also add product reviews from customers who have previously purchased the product to set accurate expectations and avoid disappointments after purchase. 2. Size and color matters! A full 54% of all returns are due to products being not being the right size or color. In addition to verifying orders for accuracy of size and color prior to shipping, some savvy e-retailers retailers like Totême, Hobbs, and Gant are using online tool such as Virtusize to help customers choose the right size of apparel or footwear. The tool allows customers to check the fit or compare product dimensions to a previously purchased similar product to get the right size and fit. Some retailers also make size recommendations based on the customer's height, weight and body shape. Customers often have questions regarding a product that are not answered in product descriptions or FAQs. Give the customer an option to speak with knowledgeable customer service representatives for immediate answers so that he or she can continue with the purchase. 44% customers prefer having questions answered by a live person when they are in the middle of a purchase. Display prominent widgets to chat or call customer service on your product page. This avoids customer frustration and limits returns due to misconceptions regarding the product. Monitor social media pages and discussion threads in customer forums, and review customer service transcripts to identify questions that are most commonly asked by customers. Add such information to your product description and FAQs to minimize confusion regarding the product. Also, take note of what products are most commonly returned and determine what corrective action(s) can help mitigate future returns. Studies suggest that 60%. of e-commerce returns are due to the wrong item being shipped. This not only disappoints the customer, but it results in added costs. Another 20% of returns are due to products being delivered in damaged or defective condition. Retailers can prevent such returns by inspecting orders for correctness and quality before shipping, as well as ensuring appropriate packaging is used to prevent damage in transit. Bottom line: 92% of customers will return to e-retailers that have easy, hassle-free return policies. So allowing free returns can help build customer loyalty. 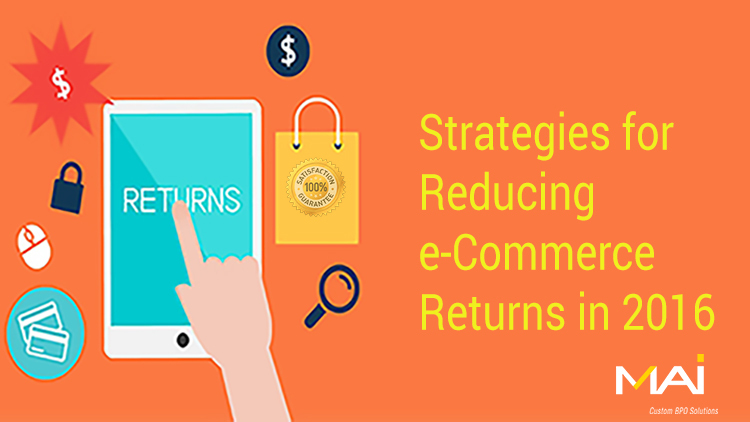 However, with the number of US e-commerce users expected to grow to 189.4 million by 2020, e-retailers need to focus on adopting simple steps that can help minimize returns in the first place.